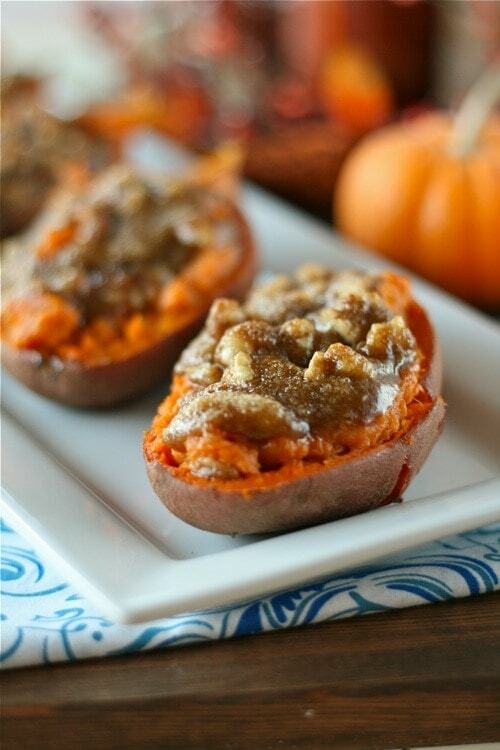 This Twice Baked Sweet Potato recipe with Walnut Streusel topping is a yummy and sweet addition that is perfect for the Holiday Season! 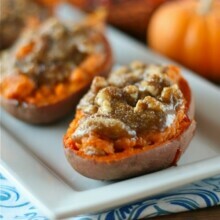 I decided to make this Twice Baked Sweet Potato Recipe with a yummy and sweet Walnut Streusel up on top. Yeah. Seriously amazing. I need a bumper sticker that says I heart sweet potatoes. Someone send me one. Thanks. Sweet potatoes are meant to be sweet, not savory. Like a pre-dessert treat with your meal to prepare you for the pies, cakes and tarts that are inevitably coming your way. And, did you know that this beloved orange potato is packed full of nutrition? How awesome! Let’s just decide now to forget all the butter and sugar we’re going to add ’cause we’ve already come to the conclusion that sweet potatoes are healthy, m’kay? 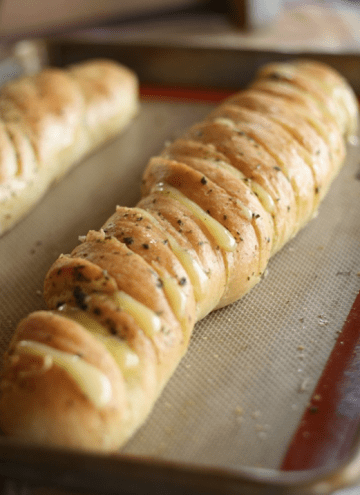 Just like all the other recipes I’ve posted, these are really simple to make and really don’t require much. Odds are you’ll have all of these ingredients in your pantry already. Except for maybe the walnuts. And Sweet Potatoes. Please remember the sweet potatoes, or else this dish might come out a total and epic FAIL. Just sayin’. So once they’re all soft and lovely, slice those babies open to reveal their bright orange insides. 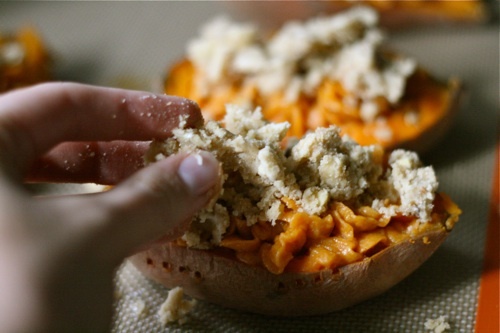 Scoop out each baked sweet potato into a bowl leaving a 1/4 inch border inside the skin. Stir in butter, brown sugar, cinnamon and salt. Mix until smooth and butter has melted. Then you can take a spoon and scoop the mixture back into the skins or take a piping bag with a nice big tip and pipe it in. I used a 1M Wilton and a disposable bag. There really is no rhyme or rhythm to piping it in, just get it in there. And keep in mind that you won’t fill all the skins back up. Count on 1 less. For example, I cooked 3 sweet potatoes giving me 6 halves. The filling I scooped out will only fill 5, kapish? So, once those are done, it’s time to make the streusel. 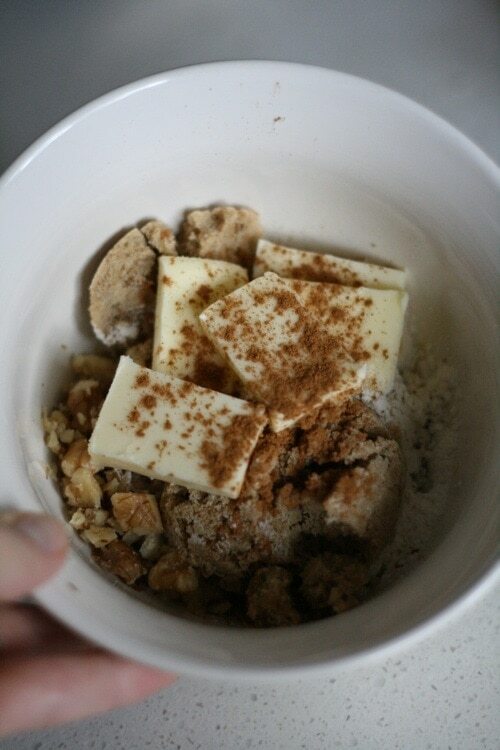 Basically, toss some butter, salt, flour, brown sugar, walnuts, cinnamon and salt into a bowl until it starts to come together. Just work the butter until it gets a little warm so you have more than just a powder. Sprinkle the streusel over top of the filled sweet potatoes and bake at 350 for 20-30 minutes. And voila! Beautiful, show stopping baked sweet potatoes. Hello my pretties. These were amazing little treats that topped off our meal perfectly. My husband, daughter and I all LOVED these and I’ll probably be making a quadruple batch next Thursday. My husband has a huge family. Have a great Wednesday and don’t forget there are only a few days left in the Calphalon giveaway. You DO NOT want to miss it! Nothing like a good streusel on sweet potatoes. These sound awesome. I love this and love it even more because I can adapt it and make it for one! My husband doesn’t do sweet sweet potatoes (or sweets in general…i know, it’s a problem), but I love them to be super sweet! WHAAA? He doesn’t like sweets? 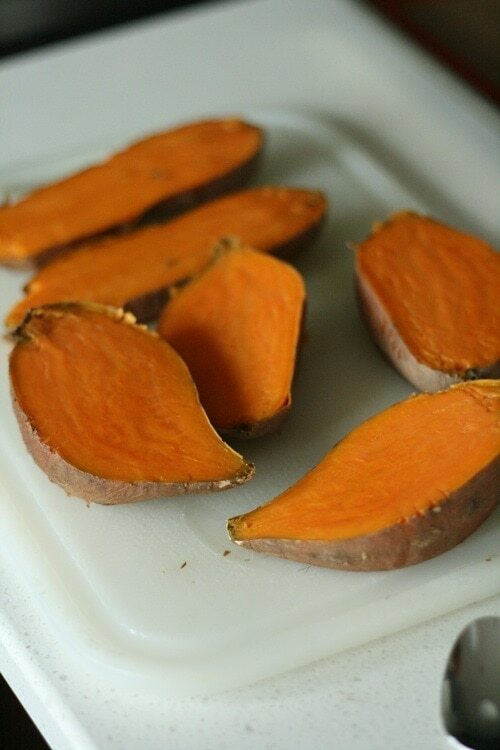 Mmmm…sweet potatoes….this is what I want my mid-morning snack to be. Like…rightnow. Kthx. these are look gorgeous! i’m not going to lie though i love my sweet potatoes savory! 🙂 have a great day Lauren! How to do you make yours savory? I’m intrigued! Not the original poster, but sweet potato is great in savory dishes. I’ve actually never come across it as a sweet dish (must be because I live in Australia). 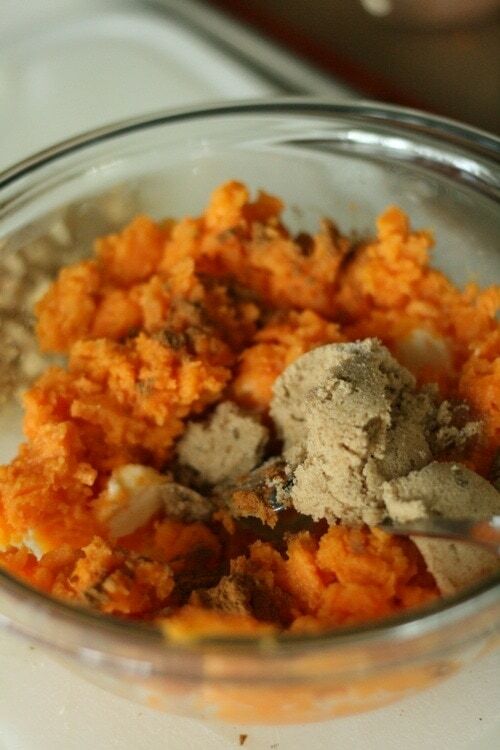 I love sweet potato and I love sweets so I’ll have to give this a try. My favourite ways to eat sweet potato would be roasted – serve it with other roast vegies as a side for roast lamb/whatever OR take the roasted sweet potato still warm from the oven and make a warm salad. Roasted vegie salad with honey mustard dressing (roast vegies, baby spinach, dressing), or warm lamb salad (lamb, roasted sweet potato and mushrooms, lightly blanched asparagus, salad leaves, danish fetta, dressing). The second one is a great light meal on it’s own or with some nice bread. ps. your blog is awesome. Trying out your irish beef stew recipe as we speak – it was great to find a stew recipe that didn’t call for wine or beer, since I don’t drink either. And I very much look forward to trying some of your delicious looking mushroom recipes. omg Lauren what are you trying to do to me!!! these are out of this world! I’ve been CRAVING this. For totes seriouslyness. These, indeed, are the bomb! I loved them. I wish Thanksgiving was today! These look great! I love the idea of making individual sweet potato halves instead of a big casserole. That streusel sounds amazing! I NEED that streusel topping! 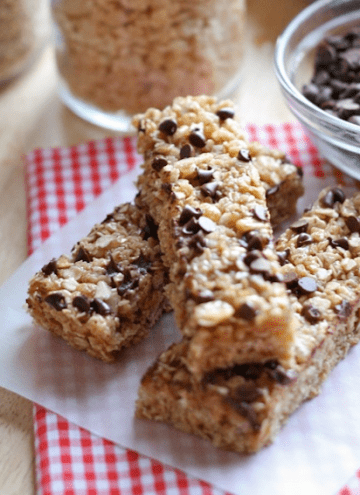 These sound absolutely fabulous, just like you! My favorite, VERY favorite Thanksgiving dish are the sweet potatoes, in any way shape or form. With a steueal topping, um yes PLEASE! These are gorgeous, I’m drooling now! They remind me of candied yams, just in a different form. I’m making these! 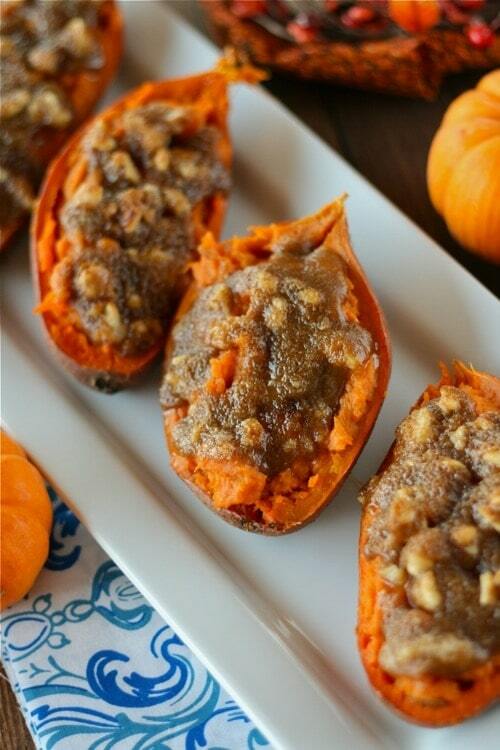 These are truly incredible… best sweet potato dish I’ve seen!! Wow, thanks Jessica! That means a lot coming from you! Holy delicious streusel topping!!! This would be a show stopper at Thanksgiving! This is a fabulous recipe! My twins love sweet potatoes (and so do I)! Definitely on the must try list for us! These look wonderful! I do sweet potato casserole with a streusel topping every Thanksgiving, but I love the idea of this even more! Those look so good! 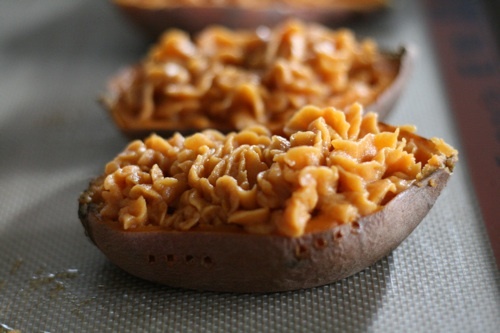 I love sweet potatoes and this looks like a great new way to enjoy their deliciousness. I will definitely be saving this recipe!! This recipe looks delicious! I liked you on FB. Thanks! This just made my thansgiving day menu! 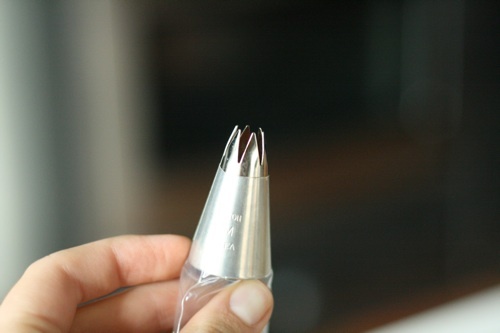 Do you think these could be made in large batches and frozen for later use? Those sweet potatoes are gorgeous, and I can only imagine how amazing they smell while they are cooking!!!! Could I use pecans vs. walnuts to make this or will the taste change? Use any nuts you like! I wish I liked sweet potatoes. To me, in my opinion, they are a useless vegetable in my house. I’ve never had them prepared in any way that I could eat and that includes a batch my mother made last year loaded with brown sugar, butter, marshmallow fluff AND marshmallows. All that sugar couldn’t mask it for me. However, that’s just me! Your version looks amazing…I may use the topping for something else! It’s like dessert before dinner. I can’t wait to try these out. 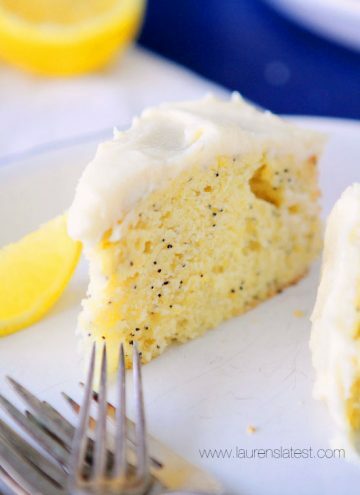 Tips for doing part of this recipe ahead? 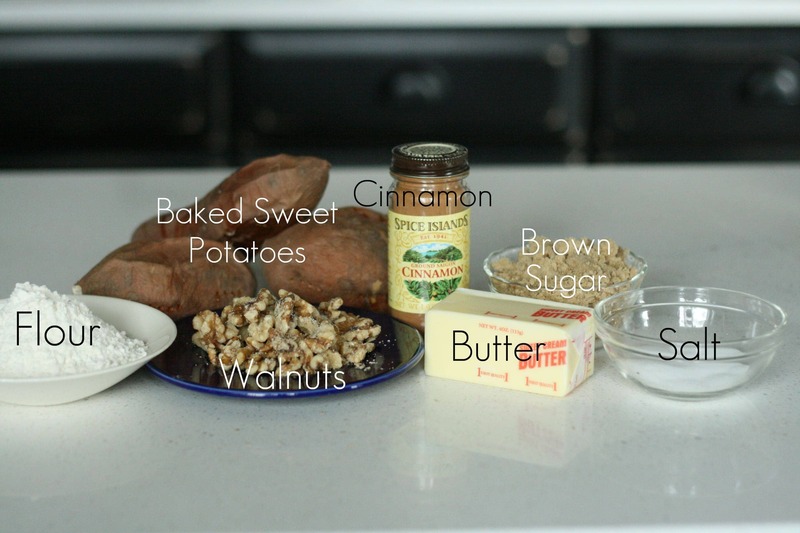 Have you ever baked the sweet potatoes the day before, and then just finished the second part of the recipe the next day? I’m always looking for do-ahead for Thanksgiving, and wondered if this would work. Yup, that would totally work! Do you suppose you could make these ahead of time and freeze them like regular twice baked potatoes? I would freeze them without the topping on them. Then defrost, add it and bake. just a quick correction, those are yams. These look so yummy! Trying them tonight on a rainy night. Great comfort food! These look so yummy! Trying to pin the recipe to save for Thanksgiving, but it won’t let me pin any or your pictures, wonder what’s up? Thanks for sharing! Love your pages!! These look FABULOUS! !1 Can they be made ahead and frozen??? These are amazing! I have made them multiple times in the past few months. This is a real keeper! Thanks, Lauren. I made these yesterday for Thanksgiving. Everyone raved about them. What a hit! I don’t personally care for sweet potatoes but your recipe made me a hero. I put a little twist to them by putting 5 or 6 mini marshmallows in the shells before piping in the potato mixture. Nice hidden sweet surprise! Also, you end up with no empty shells that way either as they help fill some space. Kudos for a fab recipe. I plan to try more Lauren. Thanks bunches!! !